The Titan Golf Buggy is designed for the more demanding golfer. The Titan Golf Buggy is more powerful, more stable and will easily handle long demanding golf courses easing over difficult terrain. 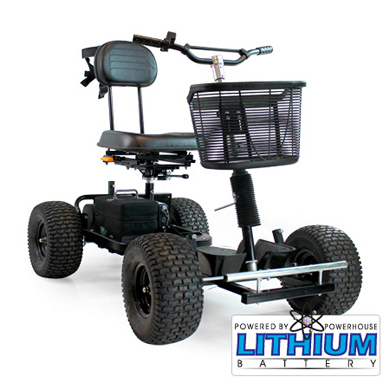 The buggy comes loaded with lithium power, meaning the Titan requires just one 18-hole lithium battery creating a weight saving of over 45kg or 9 stone from typical lead acid batteries and a significant space saving with the battery measuring just (W)160mm x (L)250mm x (H)200mm (6.25" x 10" x 8"). The Battery is supplied fully protected by a sophisticated specially designed battery management system that constantly monitors every cell to ensure the battery is always optimised for the best performance. Charging is also quicker, a flat battery will charge in around 8 hours. At Powerhouse Golf we offer a wide variety of accessories suitable for the Titan Golf Buggy. If for any reason you require replacement instructions for your buggy click here.